Autism Speaks was founded in February 2005 by Bob and Suzanne Wright, grandparents of a child with autism. Building upon the legacy of three leading autism organizations, Autism Coalition for Research and Education (ACRE), the National Alliance for Autism Research (NAAR) and Cure Autism Now (CAN), who merged with the organization, Autism Speaks has made extraordinary advancements in the autism community. Autism Speaks is dedicated to promoting solutions, across the spectrum and throughout the life span, for the needs of people with autism and their families. We do this through: advocacy and support; increasing understanding and acceptance of people with autism spectrum disorder; and advancing research into causes and better interventions for autism spectrum disorder and related conditions. We look forward to growing our community because together, there’s no limit to what we can do! What is the Charity of the Month & how does the application process work? 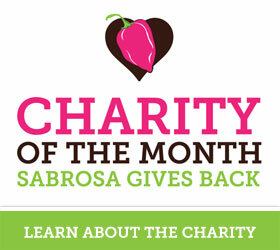 At Sabrosa, we believe in helping the community and making a difference. We believe in this so much that every month we donate to a local charity or organization within the community. 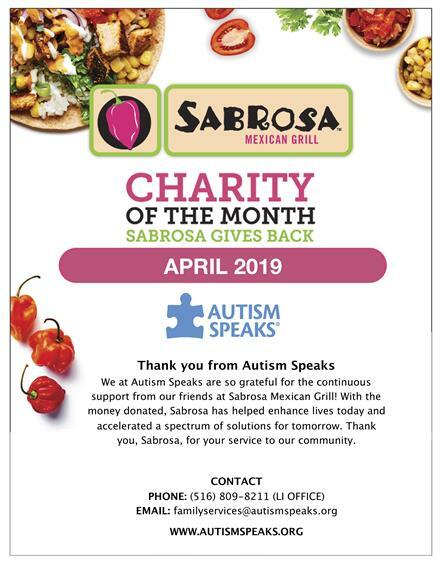 At the end of each month, we invite the charity to Sabrosa and present them with a check. If you are interested in becoming the next charity please fill out the form below and tell us about your charity. One of our Sabrosa team members will get back to you as soon as possible. Cure MS Foundation of NY Inc.
Suffolk County Police Athletic League, Inc. Turtle Rescue of the Hamptons, Inc.